Typically brown or tan with various markings; the body ranges up to 3/8″ in length, with a spherical abdomen. This is the spider most commonly found indoors. It is more of a nuisance than a threat, probably more because of its webs than the spider itself. 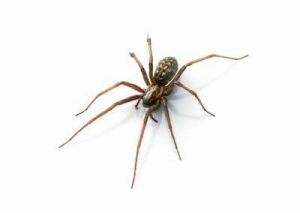 Indoors, house spiders are most likely to be found in upper corners, under furniture, in closets, around window frames, and in basements, garages and crawl spaces. If a web does not yield prey it is abandoned and a new site is selected. Eventually, successful webs are constructed where air currents bring in prey. Due to their low humidity and few insects, modern homes have fewer spider control problems than in the past. Spider control is more an issue in garages, sheds, barns and warehouses.